Kids who take part in athletic activities — whether they're playing on organized sports teams, bicycling, or just kicking a ball around — gain a host of well-documented health benefits. Yet inevitably, along with all the fun, the sense of achievement, and the character-building features of athletics, the possibility of injury exists. Does this mean your kids shouldn't play sports? Of course not! But it makes sense to learn about the risks involved, and to take appropriate precautions. How prevalent are sports-related dental injuries? In 2012, the National Youth Sports Safety Foundation forecast that more than 3 million teeth would be knocked out in youth sporting events that year! Among all the dental injuries we treat in children, it is estimated that over 25% are sports-related, and the majority of these involve the top front teeth. Besides the immediate trauma, sports-related injuries can result in time lost from school and work, and substantial cost — up to $20,000 over a lifetime to treat a missing permanent tooth. Yet there's a simple and relatively inexpensive way to reduce the chance of dental injury in children: A properly-fitted, comfortable mouthguard, worn whenever playing sports where the possibility of orofacial injury exists. You wouldn't let your child play football without a helmet and protective padding, right? Yet it might surprise you to know that kids playing basketball are 15 times more likely to sustain injuries to the mouth or face than football players! Mandatory mouthguards are one reason for that: More American kids wear mouth protection for football than any other sport, which has resulted in a dramatic drop in injuries. Mouthguards are required in only four school-based sports: football, ice hockey, lacrosse, and field hockey. Yet basketball and baseball are associated with the largest number of dental injuries. Other sports for which the American Dental Association (ADA) recommends wearing a mouthguard include bicycling, soccer, skateboarding, wrestling and volleyball. 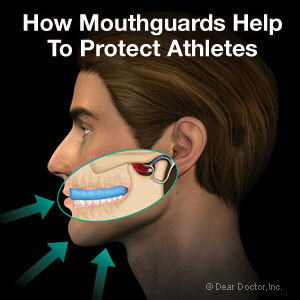 Do mouthguards work? The ADA estimates that athletes who don't wear mouthguards are 60 times more likely to suffer dental injury than those who do. 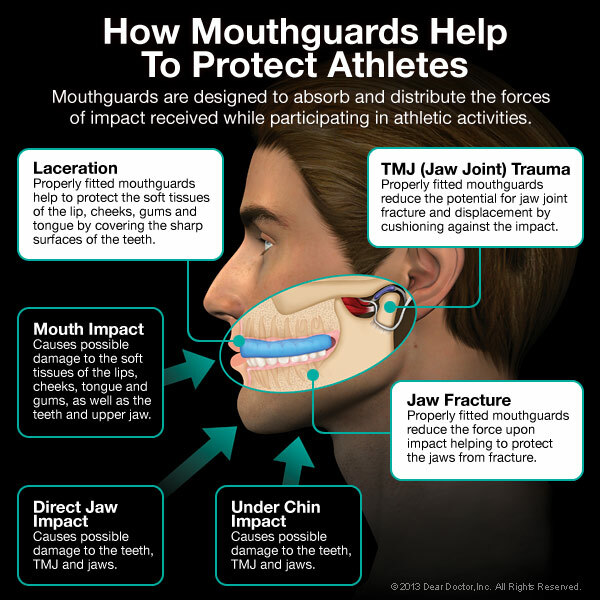 What Type of Mouthguard Is Best? An “off-the-shelf” mouthguard. Available at many sporting goods stores, this type comes in a limited range of sizes, and varies widely in quality. The least expensive option, it offers a minimal level of protection that's probably better than nothing. It generally must be clenched in the mouth, which can make wearing it uncomfortable and cause trouble breathing and speaking. The “boil and bite” mouthguard. These are designed to be immersed in hot water, and then formed in the mouth using finger, tongue and bite pressure. When they can be made to fit adequately, they generally offer better protection than the first type—but they may still be uncomfortable, and usually fail to offer full coverage of the teeth. A custom-made mouthguard. 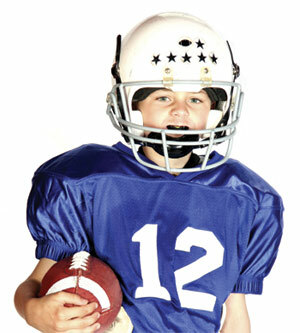 This is a piece of quality sports equipment that is custom fabricated for your child's mouth. How? Molds or impressions of your child's teeth will be made and then tough, resilient, high quality materials are perfectly fitted to that impression. This type of mouthguard offers your child maximum protection and a superior level of comfort — and its cost is quite reasonable. At the present time, when top-quality sports equipment for kids can run in the hundreds of dollars, it makes more sense than ever to invest in the proven protection of a professionally made, custom-fitted mouthguard.